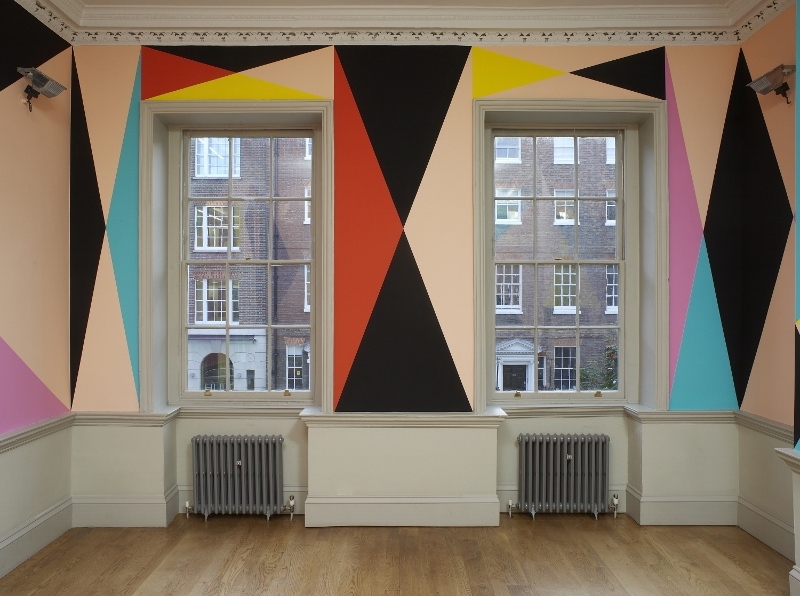 Last month I worked as artist’s assistant to the internationally renowned German painter Lothar Götz on the two week installation of ‘What Makes Boys Dance?’, a site-specific room painting at DomoBaal Gallery, John Street, London. It forms the first in a two-part exhibition, which will conclude with a select display of objects and artworks by other artists/makers curated within the context of Götz’s own work. Domo Baal is delighted to present ‘The Line of Beauty’, the first of a two–part solo exhibition by Lothar Götz. 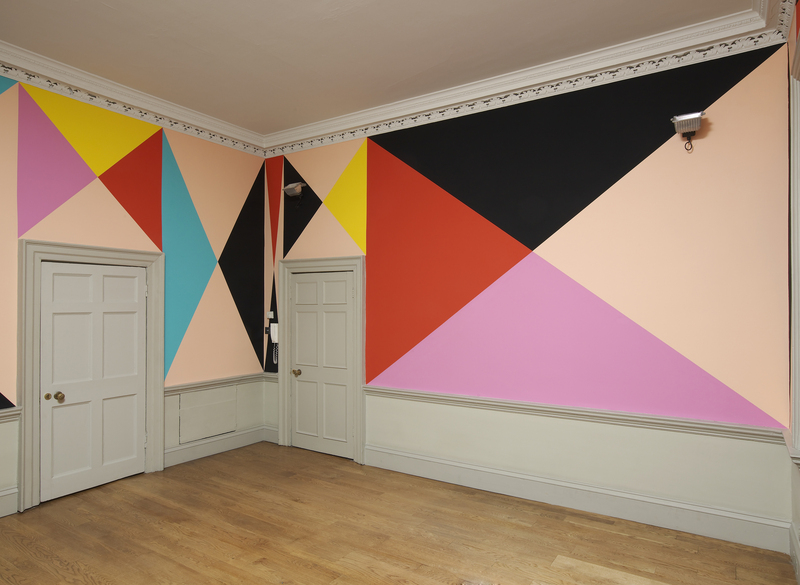 ‘The Line of Beauty’ will be Lothar Götz’s first solo show in London and follows five solo exhibitions over the last two years in public galleries in Germany and at Chapter in Cardiff. The exhibition will show new studio–based work as well as a site–specific mural. Following on directly from the first part of this exhibition ‘The Line of Beauty + Special Guests’ (9 November to 22 December) will include works by Eric Bainbridge, Neil Gall, Joachim Grommek, Daniel Robert Hunziker, Paul Huxley, Ernst Wilhelm Nay, Ben Nicholson, Uli Nimptsch and George Shaw alongside a series of new drawings, each made in response to a work by each of the exhibiting guests. 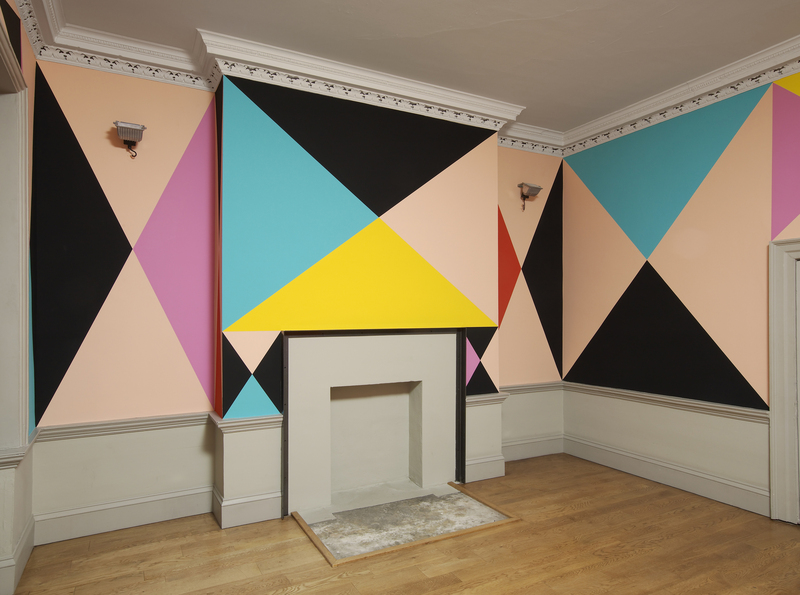 Whilst Götz’s practice ranges in scale from site–specific wall paintings and room–sized spatial installations to paintings and drawings, there is a clear coherence and dialogue across his body of work through its continual referencing and engagement with ideas about architecture and space and its characteristic use of abstract geometric forms, fields and lines of intense colour, juxtaposed with one another. His work is informed by real factors of circumstance, site, architecture or the particular inhabitants or histories of a building, space or place, but mixes these factors with further imaginary or fantasy ones. Similarly many of his drawings represent the floor plans of idealized dwellings, sometimes for specific people or historical figures, sometimes for imagined ones. Together they form part of an ongoing series exploring spatial ideas for domestic spaces: apartments, houses, bungalows, villas. Colour in these drawings is used to denote the functions and atmospheres of rooms, or the situations and qualities of the surrounding landscape – whether a schloß set in a meadow or a bungalow overlooking the sea. It also cues off the identity of the person who is thought to live there, in a web of imaginative factors that continually feed into the geometrical arrangement of forms and the colour decisions for each drawing. Götz sees colour as both beautiful and a key aspect of life that surrounds us, drawing comparison with other passions of his: gardens and flowers, and Nymphenburg porcelain. Whilst Götz often references the creation of a garden or the making of a piece of architecture in his work, he sees his practice as opposite in process to that of architectural design, which concretizes ideas and designs as built form, connecting it rather to the Classical idea of art as active fantasy – something practiced as part of a personal strategy to escape from reality. Götz completed an MA at the Royal College of Art after studying in Germany at Aachen, Düsseldorf and Wuppertal. He currently lives and works in London and is Senior Lecturer at the University of Sunderland. Recent solo exhibitions include ‘Don’t Look Now 1990 – 2011’ at Galerie der Stadt Remscheid and at Kunsthalle Wilhelmshaven, Germany, both in 2011 and ‘Wait Until Dark’ at Chapter, Cardiff in 2012. Currently his solo show’ Don’t Look Now’ is showing at Städtische Galerie Wolfsburg, Germany until 9 September 2012, and his installation ‘Crash’ will remain in situ at Stufen zur Kunst, Künstlerhaus Hanover, Germany until 20 March 2013. A monograph ‘Lothar Götz, Works – 2011′ with texts by Christoph Asendorf, Hans Günter Golinski, Rob Wilson and Oliver Zybok and graphic design by Frank Mueller, edited by Oliver Zybok in German and English was published by Hatje Cantz in 2011. Group shows include the Contemporary Art Society’s ARTfutures, Bloomberg SPACE, 2005; David Risley Gallery, London, 2007; mima, Middlesbrough, 2007; and shows in Amsterdam; Dublin; Hamburg; Hanover; Salamanca; Wilhelmshaven and Wuppertal since 2005, including participation in the 2008 Prague Triennale. In Spring 2010 he contributed a major work to an international showcase exhibition on wall–painting at the Miró Foundation in Barcelona. Public commissions include Platform for Art at Piccadilly Circus underground station in 2007, a collaboration with Caruso St John Architects at the Arts Council England Offices in 2008, Haymarket Metro Station, Newcastle in 2009 and the offices of the Secretary of State for Justice, Jack Straw in 2009. An interesting interview with the artist conducted by Sam Cornish, concerning The Line of Beauty, can be found at abstract critical‘s site.